After graduating in Business Administration, working with large companies seemed to be the natural pathway to success and happiness. Trying to combine this with her interest in sustainable development, Marina did an internship focusing on the “Base of the Pyramid” (low income costumers) of Nestlé and eventually got employed in Northeastern Brazil focusing on regionalized marketing. Northeast Brazil taught her a lot about dualities: Beautiful landscapes and a flourishing tourism, and big investments contrasted by huge social inequality and increasing violence. She returned to Sao Paulo after four years, transitioning her career to focus more directly on social impact. She had an amazing experience working with a social start-up called Aorta Comunitaria which inspires more resilient community bonds through shared urban gardens in sidewalks. 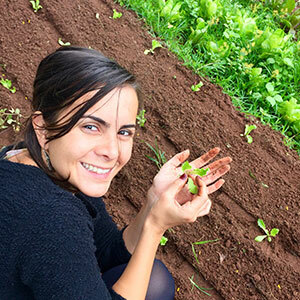 Here she especially enjoyed developing a game to help employees build and maintain vegetable gardens inside their workspace – gamifying change. Marina is now taking this “gardening game”, this time focused on public elementary schools and won a grant to continue the work. She believes that reconnecting with nature is crucial to building a sustainable world – and that the right place to start that is through disruptive education.